The new updated version of the adjustable XPE just went live for sale on Amazon and here. We have taken all of our customer feedback and made the appropriate updates to the body and the driver unit inside the LED chip set. The body was updated based on the popular Police T6 to fit on a larger variety of helmets, bicycle handle bars and gun mounts. The 3mm added to the body made this possible. The next step was to program the driver on the chip set to always start on high beam. This was a popular request from the customers that gave their feedback and suggestions for the XPE. Since most of the Simon Flashlight military and police product lines always start on high beam, this was a no brainer for the consumer version of the A XPE. The light still is designed to work only in close proximity of around fifty feet or less and is not designed to provide light at a long distance. The XPE has countless job functions and is designed to do exactly whatever is needed, based on feedback from one thousand law enforcement personnel in seven agencies, EMT’s, first responders and outdoorsman needs. The price will stay the same for the Cree XPE despite the upgrades. This work horse of a light still remains to be popular for a wide variety of uses among professionals and consumers. When asking our customers for their feedback we were simply amazed to hear about the different job functions and uses that they have been using it for. From walking their dogs in the early morning or late evening to working on the cars, trucks, boats, barns and tractors on their farms, to name just a few. 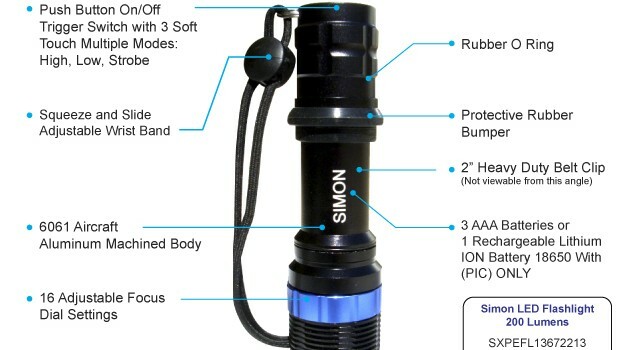 By far the most popular answer to our question of where do you keep your Simon Cree LED Flashlights stored? The answer was in the glove box of their vehicles and followed closely with one by the front and/or back door of their home. Over fifty five percent of our customers polled on the XPE torch lite said that they own three Simon flashlights after purchasing the first one and then purchasing the other units within two weeks of owning the first one. The final question was what did you as a customer like the most about the XPE? The answer was no surprise. It was the 16 dial focus settings in the small head unit of the flashlight. They liked that they were able to fan out to a flood light when needed and tight when it called for it. Most of them commented on the advanced square beam technology designed for first responders and law enforcement detectives to enhance visibility by 15 percent on the outer edges of the lights beam compared to a traditional beam. First responders liked this design feature the most, because when they need to check inside a home damaged by a tornado, hurricane or storm, the square beam helps light up the complete wall. As you know, most rooms are square or rectangle, not round and this feature was designed by first responders. Overall the small improvements help build a better LED flashlight for our customers. All of our LED flashlights are designed by our customers so your suggestions and recommendations regarding functions and features are all important to us. If we can make a consumer flashlight within our price points then we will do it. Please help us grow and share on Facebook, Twitter and Pinterest our website URL’s with friends and family. Our goal is to make affordable led flashlights from feedback from law enforcement, military, security and other professions for the general public can use.